Hundreds Of Thousands Of 'Missing' Educators; A Hundred Thousand Homeless Students : NPR Ed Plus, a 48 percent graduation rate at some of the for-profit and virtual schools often touted by Education Secretary Betsy DeVos. The island's secretary of education, Julia Keleher, told NPR Ed that she hopes the majority of public schools will be open by Oct. 23 after the devastation of Hurricane Maria. We visited two that are accepting students now, offering meals and comfort along with education. Two new investigations dig into K-12 charter schools that are online, for-profit, or both. Education Secretary Betsy DeVos has touted these models as innovative, and her family invested in one of the largest providers, K12 Inc.
USA Today and ProPublica focused on those that advertise as "dropout recovery" or "alternative" schools. Their articles found that, "Auditors have accused for-profit dropout recovery schools in Ohio, Illinois and Florida of improperly collecting public money for vanished students." Meanwhile, Politico looked at online charter schools in Pennsylvania: "The virtual charter schools' combined graduation rate is a dismal 48 percent. Not one virtual charter school meets the state's 'passing' benchmark." 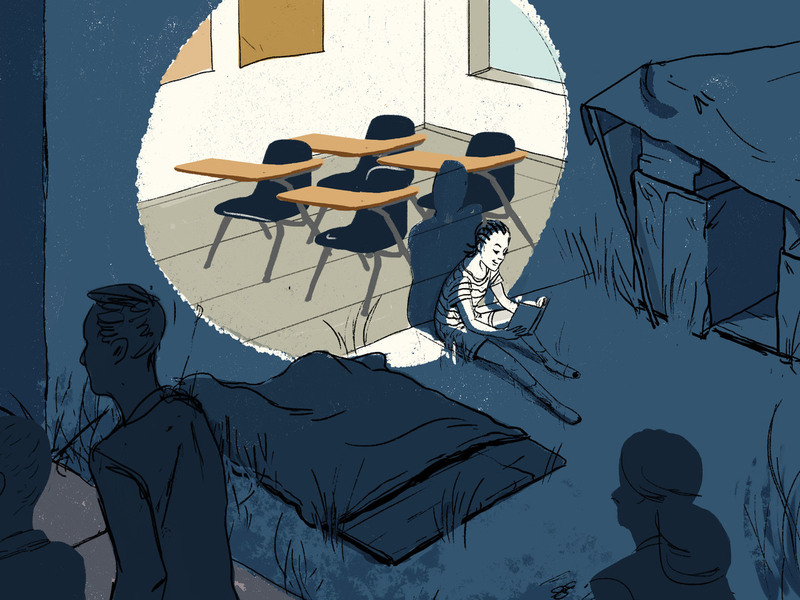 New data show that in one of the nation's largest public school systems, a record 1 in 10 children have no permanent place to sleep at night. The number is double what it was a decade ago. The New York City schools Chancellor Carmen Farina pledged earlier this year to make assisting homeless students a priority. This map shows which schools in New York City have the highest concentration of homeless students. 327,000 public educators are "missing"
The left-leaning Economic Policy Institute reports that the number of people working in public schools nationwide is 128,000 fewer than it was a decade ago, before the Great Recession. But if staffing had kept up with enrollment growth, EPI calculates, 327,000 more jobs would exist today. The shortfall, they concluded, is largely due to government cutbacks. Until this week, the federal government collected and published official graduation rates only for first-time, full-time college students, who are now a minority of all students. A new data release fills in that gap for the first time, and also separately collects the graduation rates of low-income Pell Grant recipients. The new data forms a more complete picture of how colleges that primarily serve the working class and working-age student are doing. For example, writes Michael Itzkowitz of Third Way, a Democratic centrist think tank, the University of Maryland University College graduates only 10 percent of its first-time, full-time students. But 43 percent of its transfer students, who are far more numerous, earn a degree. RunForOffice.org, a database designed to make it easier to enter politics, has just added school board to its searchable list of local elected positions.